Please find enclosed help file(chm file) in chinese chess giant setup program for more details. 1. How about chinese chess Giant 's AI level? This software is strong as chinese chess stoneman. 2. Can I use this software normally if my computer is not fast enough? Sure, you can run this software fluently on CPU 400M or above , 256M memory or above. Of course, if computer is faster, this software will be faster.Minimum System Requirements: 166 Mhz processor,64 MB of RAM,10 MB of free disk space,Microsoft Windows NT 4/2000/XP/Vista. 3.What is the main features of this game? It supports playing chess by human-computer, human-human, computer-computer with powerful intelligence. You may set its intelligence level as you like. CCGiant may fit either a beginner or an expert. You may have a private master to improve yourself. Automatic playing chess features inside. Operation is very simple. 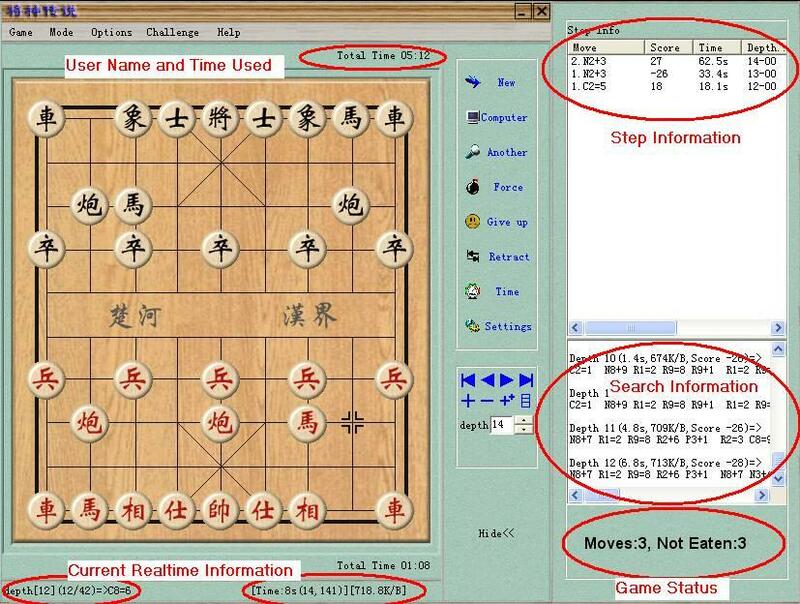 Almost any other chess software or client of online games, including MoveSky.net, OurGame.com, ChinaGames.net, QQ, 263.net, etc., can be connected. You may select "challenge¡± mode in the game. On the way to Prophet, your volition will be chastened and you may get rapid progress. The mode includes nine tests, which become more and more difficult. A title will be awarded after qualifying each test. At last, you may challenge the final boss-PROPHET! If you defeat the boss, you may get the greatest royal title and own an expert ability involuntarily. 4. How to play a lower level? If CCGiant is too strong for you, you have a few possibilities: Set the strength lower in the Options/Time Control menu. For example: Select mode of "Segmental Time¡±, and require more moves within a little time: 100 moves in 1 minute, or Select mode of "Single Time¡±, and set a less total time: e.g. 2 minutes, or Select mode of "Fixed Depth¡±, and set a lower depth: e.g. 10 depth On the way to Prophet (Challenge/[Level] menu), you can select lower level. "Beginner¡± is the lowest level. Disable pondering. You can simulate 3 moves first by using the setup position function: choose "Options/Edit Position¡± menu, make your 3 moves, and choose "Exit Editor Mode¡±. You can switch side and let computer play your side (inferior position). Force CCGiant to play on the current side, just click on "Computer¡± button. 5. How to play a higher level? 6. Can you tell me the Chinese Chess Game Rules? Chinese Chess is a game for two people playing in opposition. Both players start with 16 pieces depicting various Chinese characters, each with their own strengths and weaknesses. Play is turn-based, with Red starting. Each player has 5 pawn, 2 Canons (rows C and H), and from outer to inner; 2 Castle/Rook, 2 Knight, 2 Minister/Elephant, 2 Counsellor/Guard, and a King. The object of the game is to get your opponent's King into Checkmate (I.E. : no legal moves available), whilst defending your own King from a similar predicament. The board consists of 10 rows and 9 files (columns), divided in two halves separated by the so-called "River". The person playing first is referred to as Red, the second player as Green. The only pieces that can be promoted in Chinese Chess are the pawns. They get promoted as soon as they cross the "River", which allows them to also move to the left or right. If an opponent threatens a King with capture, that King is in 'check'. The next move must get the King out of check, either by moving the King to a safe destination square, or by introducing another piece between the King and the opponent piece(s) giving check. If a player cannot get his or her King out of Check, then it is in Mate or Checkmate and that player loses the game. Please note that if a player is unable to move his or her King, whilst simultaneously having no other legal moves available, it is also Checkmate and a loss for that player. In western Chess, this would be termed stalemate, which leads to a draw. Chinese Chess games resulting in a draw are possible but rare. If the same moves are repeated four times in succession the game is declared a draw. Here follows a description of the pieces and the way they move. The pieces appear in order of appearance on the board, moving vertically from the inner to the outer board and horizontally from the outer to the inner. Pawns move and capture one position forwards only. Having been promoted (crossed the river), they can also move left or right. Cannons move in a similar fashion to the Rook in western chess. The only difference is that in order to capture an opponent's piece, they have to jump over a single piece of either colour. They cannot jump over other pieces when there is no capture involved. The Castle/Rook is able to move in straight lines both horizontally and vertically as per the Rook in western Chess. Knights move in a similar fashion to those in western Chess. They move one space horizontally or vertically, and one space diagonally with one exception, they cannot jump over other pieces. Minister/Elephants move two positions diagonally in each of the four possible directions. They are not allowed to cross the "River" thus rendering them defensive. The Guard's job is to protect its King. It is only allowed to move in the King's restricted area and only one position diagonally at a time. The King moves horizontally or vertically within his restricted area. The opposing King is not allowed to be on the same column unless there is at least one piece in between them. 7. I have already purchased giant, how to register? Please input your register name in the first text field, and input your register code in the second text field.